Panth Rattan Shiri Gurcharan Singh Tohra (24 September 1924 – 1 April 2004) was a former president of Shiromani Gurdwara Parbandhak Committee (SGPC), a Sikh body in charge of controlling Gurdwara (Sikh places of worship). He died of a heart attack in New Delhi on April 1, 2004 at the age of 79. He remained the head of the SGPC for a record 27 years, and was one of the most influential and controversial Sikh leaders of the 20th century. Born at Tohra village of Patiala district in Punjab in September 1924, he had an early interest in religion and was an active Akali worker even before the partition of India. 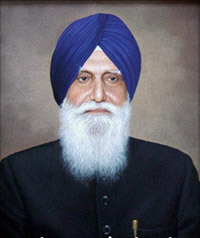 He became General Secretary of the Patiala unit of the Shiromani Akali Dal in 1947. It was his integrity and honesty that endeared him to many followers. Tohra was a member of Lok Sabha in 1977-79 though earlier he was elected as a member of the Rajya Sabha from 1969 to 1976, re-elected in May 1980, April 1982, in April 1998 and again in March 2004. He played a huge role in Sikh political affairs in post partition India. Along with Parkash Singh Badal and Jagdev Singh Talwandi, he was regarded as the triumvirate of Sikh politics in Punjab. His main domain was the Sikh religious institution, the SGPC. Though he dabbled with electoral politics often, Tohra made his mark in Sikh religious affairs. He is credited with rebuilding the institution of the Akal Takhat. An agriculturalist, Tohra was first jailed in 1945 during the Riyasti Praja Mandal Movement in Nabha, in 1950 for formation of popular government in PEPSU. In 1955 and 1960 Tohra was put behind bars in connection with Punjabi Suba agitations, in 1973 in connection with Kisan agitation in Haryana, in 1975, under MISA and under NSA and TADA and religious matters, including Dharam Yudh Morcha and Operation Blue Star (1984). Tohra became the acting president of SGPC, which manages key Sikh shrines, in 1972 after the death of Sant Chanan Singh and was formally elected its president for the first time in November that year. Tohra continued to head the SGPC, considered the mini-parliament of the Sikh community, for a record 27 years.